As I write this, I’m somewhere in the air over Florida, headed back home to Dallas from participating in the first-ever SQL Rally event. The past few days have been an adventure in many ways, and I’m happy to report that the entire experience was both positive and memorable. The trip started out in chaos: an immense line of strong thunderstorms caused massive delays at multiple airports, and as a result my flight started over 4 hours late. Along with my traveling companion Sri Sridharan, I finally made it to Orlando at just before 4am, and arrived at the hotel at about 5:15 in the morning. I was scheduled to deliver a presentation at 11:15 later that morning, and actually considered staying up the rest of the night. In the end, I managed to squeeze in about 90 minutes of sleep before heading to the Rally. Our hotel was a short drive from the conference center, and after getting the car parked and finding the SQL Rally area, we got checked in at the registration desk. Since we were a little late, there was almost no line at the desk, but there were plenty of staff in place ready handle the rush that had probably already cleared. I got to catch up with my friends Jack Corbett and Karla Landrum, and briefly chatted with Kendal Van Dyke and Andy Warren as well. Running on empty by then, I acquired some coffee and liquid B12 and found an empty room to make one last run through my demos. My presentation was in the third time slot of the day, immediately following an extended (30 minute) coffee break. I delivered a session entitled “ETL Head-To-Head: T-SQL vs. SSIS”, which is brand new material that I developed for this event. The event organizers selected my presentation as a spotlight session, which gave me a full 90 minutes rather than the typical 60 or 75 minutes. This was a welcome change, as I’m frequently finding myself wanting more time to deliver material, and the extra headroom paid off with several extra demos. The presentation went very well – the room was full, and I got a lot of interaction and many excellent questions from the audience. Based on feedback that I received during and after the presentation, I’m planning to deliver a modified version this session again in the future. After lunch and an afternoon meeting with some other group leaders, I pulled out my camera and got some snapshots of other presenters and many of the attendees. I also got to participate as an actor in a late session aimed at those who interview others; we demonstrated a few common worst practices exhibited by interviewers, and got to portray an interviewee who couldn’t get a word in edgewise with an interviewer that wouldn’t stop talking. I got to play an interview that couldn’t get a word in edgewise against a very chatty interviewer (portrayed by my new friend Jim Murphy). It was good fun with lots of laughs, but great information as well. At the end of the sessions on Thursday, many of the attendees (70 or more) went out to the Old Town area for dinner and drinks, followed by a trip to Blue Max for some SQL karaoke antics. The usual cast of characters were in attendance, including Jason Strate, Arlene Gray, Jorge Segarra, ; I found the mic and rocked out to Elvis and The Eagles. I spent some time talking to PASS board members Bill Graziano and Allen Kinsel, and made it back to the hotel around 2am. I caught up on sleep on Friday morning, and after doing a little remote work at the hotel I arrived to the conference center at about 10:30. I did a lot of session-hopping and picture-taking, and squeezed in a few conversations here and there. I had lunch with Bill Graziano, followed by another group leader meeting. Since there were no Rally sanctioned events on Friday night, many of us split up to go our own ways for dinner. I went out for sushi and sake with a small group including Mike Fal, Julie Smith, Stacia Misner (all three of whom I’d met for the first time this week), Karen Lopez and her husband Rob, and Eric Wisdahl. 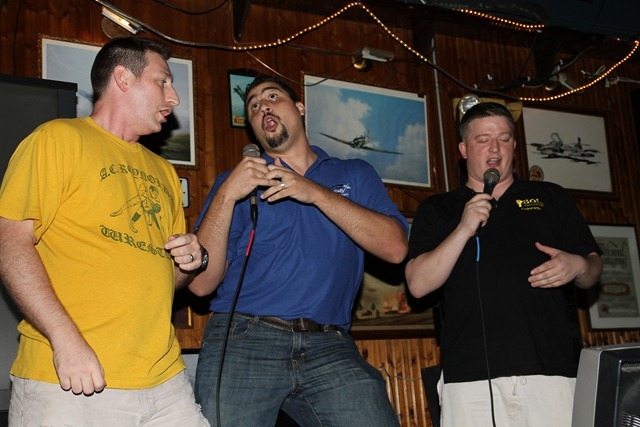 Yet another trip to the Blue Max followed dinner, where I put on an Elvis / Hootie and the Blowfish demonstration. Most of us were running on empty by then, and the party broke up about midnight. The buildup to Rally has been huge, and there was a lot of nervousness about exactly what to expect from this inaugural event. 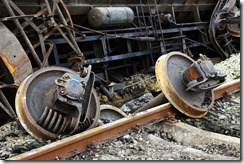 As with any version 1.0 thing, one expects some glitches, unexpected situations, and lessons learned the hard way. It’s safe to say, however, that this first SQL Rally surpassed most expectations, and was executed with few significant issues. From registration flow to communication and signage, it’s apparent that the event organizers are skilled and experienced at hosting events such as this. Experience hosting the annual Summit is helpful, but for an event of this size, I think that lessons learned from SQL Saturdays is much more applicable. 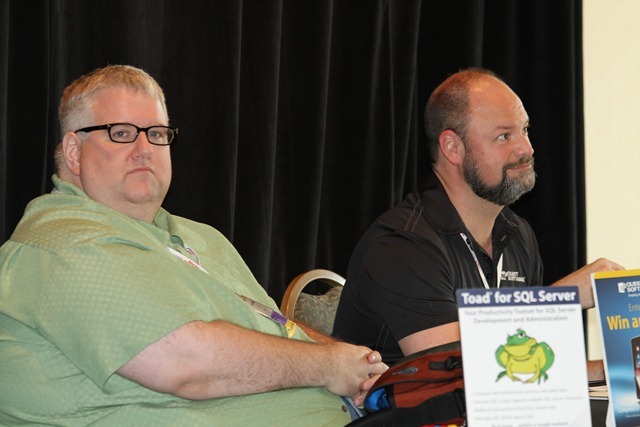 Kendal, Jack, and Karla have each led multiple SQL Saturday events in the past, and their experience was evident in the smooth execution here. The choice of venue was a critical decision. Although sized like a large (and free) SQL Saturday event, the pay-for-attendance Rally demands a higher level of professionalism, and the hotel convention center was a great choice to fit this need. The signage was mostly good – I would liked to have seen a little more in terms of directional signs in and around our conference area as well as some signage (or perhaps an ambassador or two) in the hotel lobby to help direct people, but for the size of the facility and the number of attendees, I think the signage was more than adequate. Food and drink were good. The boxed lunch wasn’t nearly as appealing – or filling – as the buffet served at the PASS summit, but was good nonetheless. Coffee and water were plentiful. Although I didn’t make it in early enough to experience it myself, I did hear of some complaints about the lack of breakfast. I didn’t see all of the sessions, but I tried to drop in on as many as I could. The ones I did see were well done and informative. 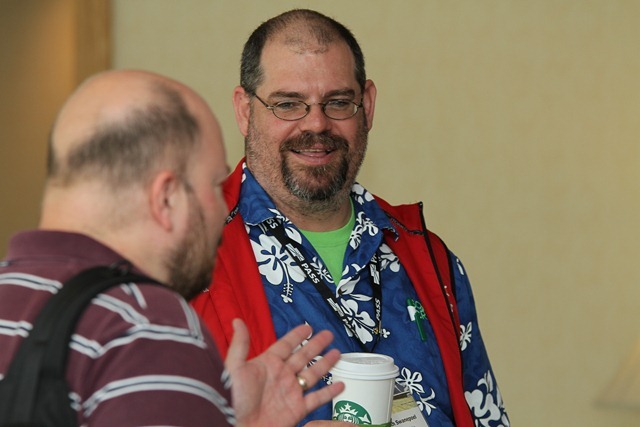 I like the concept of using Rally as an extension of the SQL Saturday model, which helps to transition up-and-coming speakers into progressively more responsible speaking engagements, eventually leading to opportunities to speak at the PASS summit. Allowing the PASS membership to select the sessions is another big win – it gives them a sense of ownership with regard to the content, and helps to ensure that the subject matter is relevant and interesting to the community at large. The result is a platform in SQL Rally that allows up-and-coming speakers the opportunity to grow while maintaining a level of quality required to support a pay-for-attendance event. Conspicuously absent was any sort of keynote. To give the real look and feel of a big conference, I would like to see a brief keynote included at the outset, or at a minimum, a general welcome session. I understand that a facility of this size and layout can make it difficult to accommodate 450+ bodies in a single room, but a common gathering at the outset helps to set the tone for the day, communicate last minute information, etc. Logistically, I would like to have seen the sponsor area set up in a different location. All of the sponsors were staged toward the rear of the area reserved for us, and it was not an area that had a lot of foot traffic. I didn’t hear any specific complaints from sponsors, but ideally their booths would be set up in a high traffic area – perhaps near (or just beyond) the registration area. From the perspective of a speaker, I would like to have had a ready room to sit and rehearse my demos. Although I was able to find a relatively unused room for this purpose, it wasn’t an option that was openly shared with all speakers. I’ve heard from other event organizers that there is a negative vibe around having a dedicated speaker room, since a few speakers choose to hide out in there rather than mingling with attendees. My opinion is that a quiet, isolated place for speakers to briefly go through their material is a necessary element for an event of this size. Another minor complaint I had from the perspective of a speaker was the lack of wireless microphones. I’m a walk-and-talk presenter, so the podium microphone did me little good during my session. It would be hard to argue that this year’s SQL Rally wasn’t a big success. Attendance was good, and apart from a speaker no-show there were no major snafus (at least that I knew of). The success of this event helped to prove the concept of Rally, and set the stage for future similar events as well. It had the feel of a miniature PASS summit with the added benefits of a lower price point and geography outside the pacific northwest. I’m looking forward to next year’s Rally! By the way, for those interested in the photos I took, you can find them on my Flickr photostream. Feel free to use as you wish. 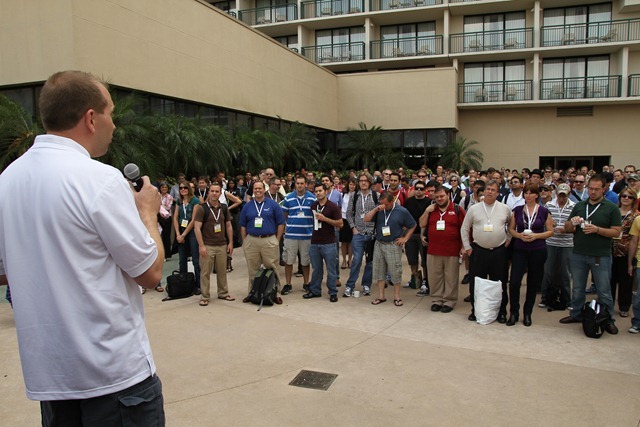 Be the first to comment on "SQL Rally 2011 Recap"